The leading sustainable transport charity, Sustrans, has shown that cycling could halve workplace sickness, and inject £13.7bn annually into British businesses through improvements in productivity. According to the research, people who cycle to work take just 2.4 sick days each year compared to the average rate of 4.5 days for those who do not. The charity surveyed cyclists on the National Cycle Network and also found that 68% of cyclists had taken no sick days in the previous year. “Employers who encourage cycling can increase their profitability and have employees who take fewer sick days, but too many miss out on these benefits because they don’t provide decent facilities and support”, explained Sustrans chief executive Malcolm Shephard. As well as the health and productivity benefits that cycling has to offer, by encouraging employees to cycle to work, organisations can dramatically reduce their wage bill. Many employers are still unaware that by offering the cycle to work scheme to their staff they too will typically save 13.8% of the value of bikes through reductions in the employer’s national insurance contributions they are required to pay. When you add up the overall savings available to employers it is surprising that there are still companies out there that don’t offer the benefit. 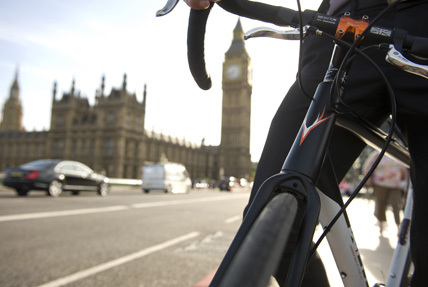 Find out how your company can benefit from promoting safe cycling to work.